Car manufacturers are falling over each other to breathlessly tell us how the coming decade will see more change to their industry than in the previous century. With daily headlines shouting about electrification and automation, you would be forgiven for thinking this means a future of robo-taxis shuttling us joylessly from A to B. But the reality couldn’t be further from the truth, as 2018 is set to be a vintage year for cars. The next 12 months will see legacy manufacturers like Jaguar, Honda, Porsche and VW get up to speed on electric and hunt down Tesla. It will also be a year where supercar companies take two routes; one will see hybridisation adopted as a means of making the world’s fastest cars even quicker, while the others have one last hurrah with internal combustion. In the background, cars will get smarter and take over even more of the driving. SUVs have been all the rage for years now, but more recently manufacturers have become obsessed with making them as fast and as brutish as possible. The Stelvio Quadrifoglio is definitely one of these, but manages to blend 503 horsepower and a 0-62mph time of 3.8 seconds with enough Italian style to just about get away with it. A close relation to the Ferrari California T’s V8, the Stelvio’s 2.9-litre V6 and its 8-speed ZF gearbox with oversize Ferrari-style shift paddles gives the Alfa so much more soul than its German rivals. No matter how much more reliable we suspect they may be. The death of the simple and affordable sports car has been greatly exaggerated, according to Alpine. Part of the Renault group, Alpine’s A110 is a reimagination of the 1960s original of the same name. It’s a two-door coupe and powered by a 1.8-litre, four cylinder turbocharged engine pushing out 249 horsepower. That may not sound like much – indeed, some hot hatches have more these days – but a lightweight construction means the A110 can hit 62mph in 4.5 seconds and has an electronically limited top speed of 155mph. Every time we see the Valkyrie we have to remind ourselves that it is road legal. The Valkyrie is what happens when F1 design genius Adrian Newey is let loose and told to make his perfect road car. Inside the shrink-wrapped body sits a 6.5-litre naturally aspirated V12 engine producing 1,130 horsepower. There is also an F1-style kinetic energy recovery system and hybrid battery pack built by Rimac, and the sci-fi bodywork is said to generate more downforce than the car weighs. Buyers of the £2m Valkyrie have already been chosen and the 150 vehicle production run is due to start later this year, before a further 25 examples of the track-only and even more extreme Valkyrie AMR Pro will be built. At the other end of the Aston Martin stable, 2018 will bring us the long-awaited new Vantage. To take on the Porsche 911 in the junior supercar league, the 2018 Vantage shares more than a passing resemblance to the Aston DB10 built exclusively for James Bond film Spectre. Up front there’s an AMG-sourced 4-litre V8 with twin-turbocharging and a power output of 500 horsepower. Aston’s entry-level car is good for 195mph and hits 62mph in 3.6 seconds. Prices start at £120,000. Audi’s push into the all-electric market will begin with – surprise, surprise – an SUV. Although not fully launched just yet, Audi recently showed off the car in camouflage paint and has begun taking £1,000 deposits from eager early adopters. To compete with the Tesla Model X and Jaguar I-Pace, the e-tron is claimed by Audi to have a range of just over 300 miles, and power is expected to be in the region of 500 horsepower. As with all electric cars, acceleration is expected to be sports car fast, with the 0-62mph sprint tipped to take about 4.5 seconds. A roofless version of BMW’s i8 hybrid sports car has been a long time coming, but in 2018 it will finally go on sale. To launch alongside a subtly revamped hardtop i8, the new Roadster is powered by the 1.5-litre engine from a Mini - but fear not, because there are also three electric motors to give the i8 all-wheel-drive and a total power output of 374bhp. Match this up to a lightweight carbon fibre-reinforced-plastic construction and the i8 Roadster will still manage 62mph in 4.6 seconds (two tenths shy of the coupe) and a limited top speed of 155mph. Most importantly, the spaceship design and look-at-me dihedral doors remain in place. BMW has priced the i8 Roadster from £124,730, or exactly 12 grand more than the £112,000 coupe. Also new to the BMW stable this year is the 2018 M5, which features four-wheel-drive for the first time. However, drivers wanting tail-happy rear-wheel-drive like the M5s of old can dig into the car’s iDrive computer system and pick between 4WD, 4WD Sport and 2WD. But with 592bhp coming from the car’s 4.4-litre twin-turbo V8 – and a 0-62mph time of 3.4 seconds – BMW says rear-drive should only be engaged on the race track. As well as performance to embarrass a supercar, the new M5 has enough technology to put almost any other car to shame. There’s an autonomous driving system for handling stop-start traffic on your behalf, an optional Bowers & Wilkins sound system, carbon ceramic brakes, and even a way to manoeuvre the car out of tight parking spaces from the key fob – and with no one inside. Although it succumbed to turbocharging a few years ago, Ferrari has so far steered clear of hybrid power for its production cars – limited-run LaFerrari notwithstanding. This remains the case for the 488 Pista, a hotter, lighter and more extreme version of the 488 GTB, Ferrari’s mid-engined, two-seat supercar. Revealed at the Geneva motor show in March, the Pista (that’s Italian for track, by the way) ups power from 661 horsepower to an outrageous 710 from its 3.9-litre, twin-turbocharged V8. But it isn’t just about more power – Ferrari has seriously reworked the 488’s bodywork to give the Pista 20% more downforce, and put the car on a diet to the tune of 90kg. Version 6.0 of Ferrari’s witchcraft-like Side Slip Angle Control System lets the drivers exploit all 710 Italian horses, then discreetly offering a helping hand before you run out of talent. The last Fiesta ST was one of the best hot hatches ever made, so we will be expecting great things from its replacement when it goes on sale later this year. Powered by a new 1.5-litre three-cylinder turbo engine (which, we know, doesn’t sound particularly exciting), the new Fiesta ST will produce 197bhp - 17 more than its predecessor. For the first time in a Fiesta, the new ST has driving modes to pick from. Like its big brother the Focus RS, the ST offers Normal, Sport and Track modes, with each adjusting the traction control, throttle response, power steering and exhaust soundtrack. Also new from Ford for 2018 is the new Mustang Bullitt, which pays homage to the infamous Steve McQueen film of the same name. There have been Bullitt Mustangs in the past, but this is the first to be offered with right-hand-drive and officially sold in the UK. With a 458bhp, 5-litre V8 and a burbling exhaust note, the Bullitt will satisfy your Hollywood car chase fantasies every time you pop to the shops. Order books are set to open in the UK this autumn, with deliveries commencing at the start of 2019. Honda won the car world’s collective heart when it revealed the Urban EV concept car back in 2017. It’s small, cute and wonderfully retro, with an interior to match and promise of an all-electric drivetrain. Such as the outpouring of love for the car, which reminds us of hot hatches from the 70s, Honda now says it will reveal a production version before the end of 2018 - and after that, the order books will open. We know very little about it for now, other than it’s a small electric car, but we suspect Honda will want to pitch the Urban as a small but fairly premium EV. All we’re hoping for is that Honda sticks to the concept as closely as possible. Speaking of staying true to the concept, the Jaguar I-Pace is about to arrive in dealerships. Jag’s first electric car, the I-Pace you see here looks remarkably similar to the concept version we saw back in late-2016. To square up against the Tesla Model X, the I-Pace is all-wheel-drive, produces almost 400 horsepower, and has a claimed range of 300 miles if you drive sensibly. Jaguar says 62mph is dealt with in 4.8 seconds and the top speed is 124mph. Jag says it has worked hard to make the I-Pace’s electric whirr sound interesting, so as the car accelerates the soundtrack is tuned to become a little louder and more intense. It might not be the barking and crackling exhaust note of a V8 F-Type, but we appreciate the effort nonetheless. SUVs are taking over the world, so of course it was about time that supercar makers got in on the act. With Ferrari secretly working on its ‘FUV’, Volkswagen-owned Lamborghini was first to blink, and Urus deliveries will begin in the UK very soon. Prices start at around £165,000 and for that you get an SUV with a 4-litre V8 twin-turbo producing a wonderfully unnecessary 650bhp. This will haul the off-roader from standstill to 62mph in 3.6 seconds and on to a top speed of 189mph. We say off-roader, but imagine the closest any Urus will ever get to going off road is when the autumn leaves begin to pile up outside Harrods. This, we are thrilled to say, is a three-seater built by McLaren as a modern day successor to the legendary F1 of the 90s. Code-named the BP23, this car will have a top speed of over 243mph (making it the fastest McLaren ever) and a central driving position with a passenger flanking on either side. 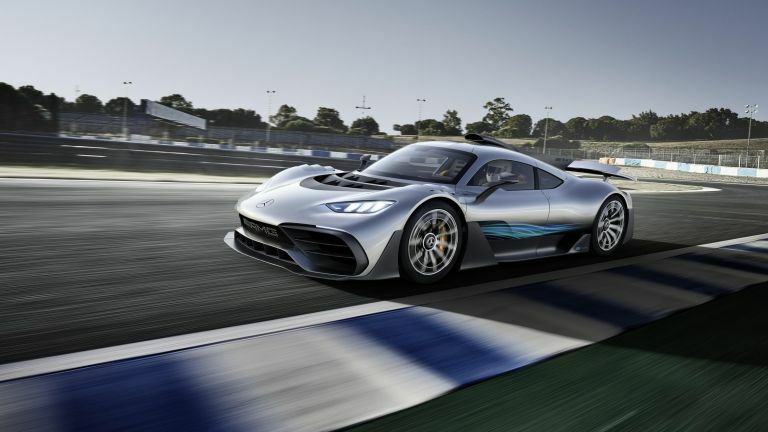 Just 106 examples will be made – echoing the production run of the F1 – and power is expected to come from a hybrid drivetrain producing in excess of 1,000bhp. But instead of being some kind of track weapon, McLaren is pitching the BP23 as the ultimate in high-speed luxury. This is a car to travel – with two passengers and maybe even some luggage – to the south of France without breaking a sweat. Announced in late-2016, we expect to see the BP23 in the carbon before the end of the year. Another hypercar due to be delivered by the end of 2018 is the Project One by Mercedes-AMG. All you need to know is that this car is powered by an engine very closely related to that used every other Sunday by Lewis Hamilton. Yup, this is a multi-million-pound road-legal hypercar with a (slightly detuned) Formula One engine in the back. That means a turbocharged, 1.6-litre V6 petrol engine (F1 motors are surprisingly small) with a hybrid system, an 11,000rpm red line, and a power output in excess of 1,000bhp. Mercedes plans to build 275 examples, and before you reach for the phone we must regretfully inform you that they’re already sold out. How about something a little bit different? Okay, how about a lot different? That’ll be the Morgan EV3, an electric version of the company’s quirky three-wheeler. The EV3 will be the first electric car to be produced by Morgan, a small-scale British sports car maker founded in 1909. Power comes from a 21kWh battery, which will take the sub-500kg car to 62mph in under nine seconds and up to 115mph if you’re feeling particularly brave. Morgan claims the EV3’s range is 120 miles – after which time you’ll probably want to get out, de-mist your goggles and extract the wildlife from your hair. Mission E is a huge deal for Porsche, as it refers to the company’s first two all-electric cars. The first – which is yet to receive its proper name – will go into mass production before the end of 2018 and is a four seat sports saloon car aimed at the Tesla Model S. Porsche says it will produce over 600bhp, reach 62mph in under 3.5 seconds, and have a real-world range of 300 miles. Porsche is also investing in a super-fast charging infrastructure which will eventually use 800-volt chargers to give the Mission E 250 miles of range on just 15 minutes. Quite literally the polar opposite of an electric Porsche, the new TVR Griffith is an old-school, lightweight, £90,000 V8 supercar with a top speed of 200mph, and that most unusual of things – a manual gearbox. The rebirth of TVR, a British sports car maker formerly headquartered in Blackpool, has been a long and arduous process, and we can’t help wondering how many people will actually hand over the cash for such an unknown entity. We hope they do, of course, because the British car industry – indeed, the supercar world – will be a better place with TVR back in it. Apparently all 500 ‘Launch Editions’ have been sold, and production will begin before the end of the year. Finally, we have the Up GTI, a car Volkswagen itself is proud to describe as a modern reincarnation of the original Golf GTI. The Up is light like the old Golf (997kg vs 810kg), has a very similar power output as the Golf (113bhp vs 109bhp), and they both have tartan fabric seats. Classy. Cheeky, cheap and – we suspect – boundless fun, the Up GTI is a timely reminder that, in a world awash with 1,000bhp hypercars made from Unobtainium, we can be as equally excited by a tiny £14,000 hatchback.